At Tuvalu, we love finding unique and quality vintage or new-vintage pieces for you to add to your home. But how do you incorporate all these items in your home and still keep it looking fresh? Here are some good rules to go by to make sure your home looks less Grandma and more Glam-ma. Don’t go overboard. Mix in a few vintage pieces with newer items for a unique look that you couldn’t achieve with an entire house of new pieces or an entire house of vintage items. Love thy Seamstress (and your decorator, too). 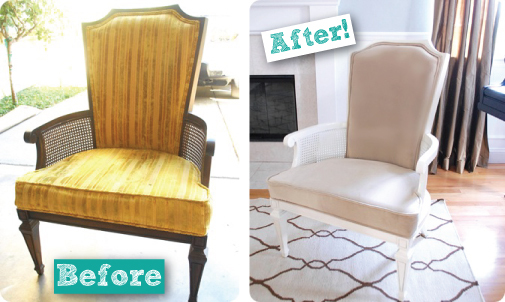 So you found a worn and torn, cane-backed, bamboo chair (score!). You know it’s got great lines, but now what? It’s a great idea to build a relationship with a local designer (like Tuvalu!) for times like these. It’s sometimes pretty tough to visualize what color paint and upholstery would take the flea market find from drab to fab. We love brainstorming ideas with clients on items like this and can help you pick fabric and facilitate the recovering or repair of great vintage finds. Thrifted vs.Vintage. Know the difference between these two. 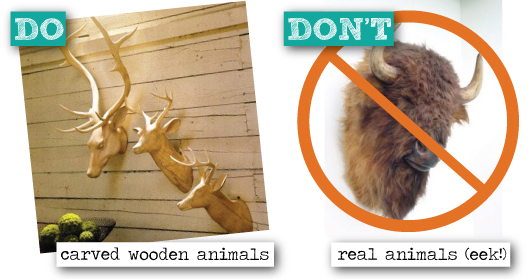 Just because you found it at a vintage store doesn’t mean it’s a vintage item that you want in your home! Don’t Underestimate the Power of Accessories. If a reclaimed wood sideboard is not your thing (or not in the budget right now), use smaller pieces like accessories to get the vintage look. An added bonus: if you get tired of the item its simple and affordable to replace with another vintage or new piece.